I thank the people of Berwick and vicinity for the great support they showed when I held my four-day Yard Sale for Animal Resource Center (ARC): the people who dropped off donations to my home, donated tables, came early to help me set up the tables, helped load up and haul unsold items back to the storage garage in Buckhorn. Thanks to the people who entered the raffle and donated their winning items back to ARC. Thanks to all the people who could not find “anything they absolutely could not live without” and dropped a donation in the donation jar. Thanks to those who took key tags to help with donations when they shop at a local food store. These things are what make a community effort a great one. 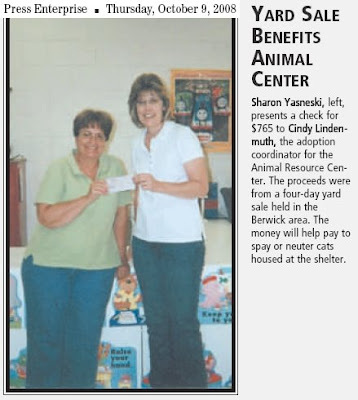 ARC is all volunteer-based, and fund-raiser efforts are needed to continue to help homeless and abused animals. The support I received was overwhelming, and I appreciate it so much. I want to thank my neighbors for their donations to this cause and also for their patience and understanding. The sale netted $765. Next year I hope to do even better.